Good Food for Little Cash: Grocery Shopping on a Budget was an article that helped me focus on my cooking habits, but one thing I didn’t mention were the tips and tricks for preparing and storing food. 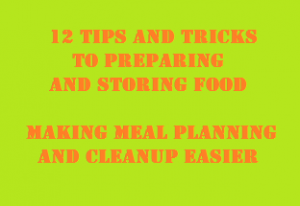 Using these 12 tips and tricks for preparing and storing food, after each grocery trip has streamlined my cooking experience and made meal planning and cleanup easier. 1. Wash off any dirt, and then clean your fruits and vegetables with 1 part/cups distilled white vinegar and 3 parts/cups water. Use a spray bottle to cover smooth skinned fruits and vegetables (strawberries, raspberries, peppers, eggplant) and let set for about 3 minutes, then rinse the vinegar solution off, and let the fruit/vegetable dry on a towel. For rough skin or leafy fruits and vegetables (kiwi, broccoli, cauliflower, spinach, and lettuce) fill a bowl or clean sink with the vinegar solution and let them soak for about 5 minutes. Then rinse the solution off and let dry on a towel. It is good to use this solution on all fruits and vegetables (even those you remove the skin of) because many farmers use pesticides and many produce have harmful bacteria on their skin, that when cut or bitten into can leave you sick. 2. With clean dry fruits and vegetables cut up the produce you will need for the week and store it in the measurement sizes you will need for each meal, and make sure you have some set aside for snacks. 3. Prepare meals ahead of time: salad in a mason jar will last for about a week (bottom to top: dressing, fruit, nuts, broccoli, carrots, spinach, lettuce); boil eggs for breakfast, a snack, or to use in tuna/chicken salad; overnight oats (a flavorful oatmeal that doesn’t require heating and last 2 to 3 days in the fridge); and hummus and hot sauce last a week in the fridge. 4. Replace original frozen fruit and veggie bags with quart size freezer bags. Place 2 cups of the fruit or veggie in each bag, roll the air out, zip closed, spread the produce flat, write the measurment on the bag, and place in freezer. This allows the frozen produce to lay flat in the freezer, take up less space, and make it easy to grab the amount you need without additional measuring. The standing bags frozen produce comes in (like the Dole brand) take up more space in the freezer and the ones that are supposed to lie flat don’t have all the air removed and can result in damaged food. (12 oz. Great Value blueberries = 1 ½ – 2 cups; 16 oz. Great Value strawberries = 3 -4 cups; 16 oz. Dole Mangos = 4 cups). 5. Freeze extra fruits and veggies (or those needed for smoothies). Freezing Vegetables: Blanch clean veggies first in boiling water, and then submerge in ice water, dry thoroughly, place in air-tight container (filling to top) or freezer bag. Frozen vegetables will last about 18 months. Make sure your freezer temperature is at 0°F or colder. Freeze fruits and vegetables quickly while they are fresh. Make sure you remove as much air possible from your container. 6. Freeze extra hot sauce in a quart mason jar. 7. Freeze extra yogurt cups and if you place a popsicle stick in them before freezing you can have a yogurt pop. 8. Freeze dough in a tube (biscuits, crescent rolls, cinnamon buns) or homemade dough. 9. Freeze blocks of cheese or shredded cheese (make sure to thaw completely before use). I hope using my 12 tips and tricks help you make meal planning and cleanup easier. What are your tips and tricks for preparing and storing food?